Lessons in Goal Setting from an 11 year old - The things we can learn from our kids! Recently, I was inspired around the power of Goal Setting – yes inspired (as opposed to frustrated, irritated or exhausted) by my 11 year old son and here’s why. 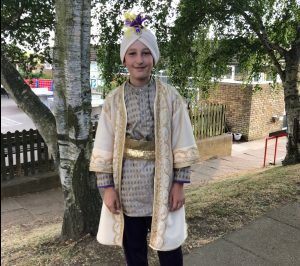 As a Year 6 child he is reaching the end of his final term in junior school with the current focus being on the end-of-year theatrical production. This is a big event each year with previous productions being Grease; The Lion King and The Sound of Music and Year 6 children get to take on the starring roles. Sammy is a reasonably confident boy with a nice singing voice but had dropped out of theatre group a few years ago having started to get acutely self-conscious on stage so I wasn’t really expecting him to be terribly excited by this production. However, to my surprise he declared that he wanted to be Aladdin! Obviously, I encouraged him and he brought home the script, he rehearsed it with some help and put lots of effort into practising the song “A Whole New World”. Unfortunately when the week of auditions came he was a little disappointed in his performance, he had been full of cold and also had to deliver his ‘solo audition’ alongside another louder and less tuneful child. On the Friday before half term a crestfallen 11 year old arrived home with a somewhat confusing story. Apparently, because the parts were big the school was splitting them in two and they had assigned Aladdin to two children, neither of whom were Sammy. Clearly, these things happen and we moved into parental empathy mode when the story became more confusing. The second ‘Aladdin’ had apparently turned down the role because they wanted to be a different character and the teacher had suggested there might be further auditions after half term, however, Sammy had been given no signals that he would be in the running for this role. I really didn’t want to spend half term building up false hope when Sammy’s first audition clearly hadn’t gone so well and asked the teacher for more information. I have to say, I felt for her as the second Aladdin seemed to have changed their mind again and wanted the part but she had already told both classes that there would be more auditions so she felt she had to follow through. In the interests of managing expectations, I asked for feedback on Sammy’s performance and she explained that he seemed to have ‘held himself back’ during the audition and pointed out that there were a number of other significant but not leading parts that might suit him better. Armed with clarity, we moved into downplaying Aladdin and focused on other end of year school activities like sports day and ‘The Young Apprentice’. A week or so after half term, my heart sank when Sammy announced that they would be re-auditioning for Aladdin – I was concerned that he would put his heart and soul (and my time) into rehearsals again, only to be disappointed once again. However, he wanted to rehearse and as I have spent many years as a trainer, it is tradition in our house for me to support and coach the kids so we practised in the kitchen and I was trying to help him use gestures to be a bit less wooden! The next morning, I was in a hurry when Sammy wanted to rehearse so I got him to practise behind me while I put my make-up on in the mirror, little did I realise how important this would turn out to be. Off Sammy went to school, delivered his audition and came home quite pleased with himself. When he started the debrief and explained that 11 children were in this second round of auditions, I was full of anxiety – my own fear of failure kicking in on his behalf. I asked whether he had managed any gestures and it seemed he had – in fact he was one of the last to audition and hadn’t seen the ones before him because he was late out of lunch. It was only when he came off stage that one of the other children told him that he was the only one to audition without the script in his hand. Because he wasn’t restricted by the script he had felt free to do some of the gestures that he had rehearsed and it seemed that his solo (sang solo this time!) also went well. Feeling cautiously optimistic we discussed the positives around getting the role or not getting the role and waited to hear more. The following day Sammy arrived home feeling deservedly proud of himself as he had been awarded the part!! I was completely blown away and hugely inspired. He had been turned down for the part and it had actually been given to someone else yet he had kept his eye on the goal. He hadn’t let fear of failure or disappointment stop him and it had ended up with him effectively changing what had been written. As adults, how often do we stop believing or give up trying because we’ve been given ‘No’ for an answer or even before? For me, there is so much to learn from this life lesson in goal setting from my 11 year old! PS: If you wondered about the significance of the mirror – I found out later that it was only when he rehearsed in front of the mirror that he saw ‘how boring’ he looked without gestures. That insight (from reflection) gave him the confidence to deliver them at the audition and win the part. Life lesson number 2 – the power of reflection!